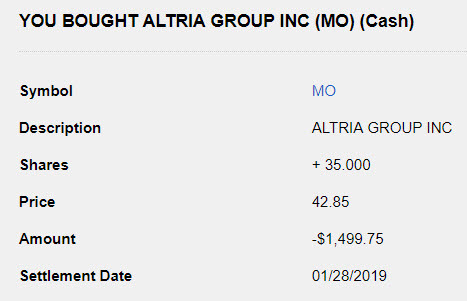 There is no doubt that Altria stock (MO) has been getting absolutely hammered lately. Over the last two months or thereabouts, Altria stock has declined over 30% and has caused some to run for the hills despite their long-standing history of consistent, rising dividend payments. While Altria certainly has some headwinds that may pose some challenges, my opinion is that some of the latest developments may actually be good for them and their recent investments / acquisitions with Juul and Cronos. The following is purely my opinion and not backed by any substantive research or supporting evidence. I added an additional 35 shares @ $42.85/share to my portfolio. This purchase will add an additional $112.00 to my projected annual dividend income as well. Altria has been getting hit from all angles recently, including the recent downgrade from Citi to a sell rating in December and Morgan Stanley’s warning on the impact of accelerating cigarette volume declines. In addition to that, the market has also reacted to what many believe to be a significant over-payment for their stake in both Juul and Cronos. I’ll tell you this. If the youth use continues to rise, and we see significant increases in use in 2019, on top of the dramatic rise in 2018, the entire category will face an existential threat. I find myself debating with tobacco makers and retailers the merits of selling fruity flavors in ways that remain easily accessible to kids. But if the epidemic continues to mount, I’m sure that the debate will change to one of whether these products should continue to be marketed at all without authorized pre-market tobacco applications. It could be “game over” for some these products until they can successfully traverse the regulatory process. I think the stakes are that high. And would be a blow for all of the currently addicted adult smokers who, I believe, could potentially benefit from these products. Lastly, Commissioner Gottlieb has also been on record indicating that he would like to eventually ban menthol cigarettes and reduce nicotine levels to non-addictive levels. It is pretty clear to understand why Altria has been taking a beating based on all of the above. With that said, I actually believe that all of these items may actually benefit Altria. It will certainly not happen overnight but I do believe that Altria has made their recent acquisitions with an understanding that these challenges would lie ahead of them. In hindsight, I do agree that the price paid for Juul was excessive and had they waited another month or two, they likely could have made that acquisition at a much more reasonable valuation. But it costs money to be first. It could be “game over” for some these products until they can successfully traverse the regulatory process. Looking at this from an industry perspective, can you think of a company more suited for traversing the regulatory process as it relates to nicotine and/or tobacco products than Altria? While Juul already dominates the market, I envision Gottlieb’s comments to benefit Altria and Juul by essentially halting their competition in their tracks. Juul has approximately 70% market share and if the FDA does in fact crack down on the e-cigarette industry, that could easily become 100% market share. Altria and Juul certainly have a challenge with the volume of underage consumers using the product, and I am in full agreement that this needs to be addressed. However, since Altria acquired their stake in Juul, I have already seen two different television commercials for Juul promoting the product as a healthier alternative for adults that are attempting to quit smoking. Again, in terms of underage usage, this is a battle that Altria has been through before with cigarettes. Not only that, but it is one that they have navigated quite well and dominated the U.S. market in cigarette sales. Therefore, while I have read countless articles thinking that this is the nail in the coffin for Altria’s investment in Juul, I actually see this being a boon for Altria and Juul. Even if the above works out for Altria, what about the FDA’s desire to reduce nicotine levels in cigarettes? Because nicotine lives at the core of both the problem and the solution to the question of addiction, addressing the addictive levels of nicotine in combustible cigarettes must be part of the FDA’s strategy for addressing the devastating, addiction crisis that is threatening American families. Our approach to nicotine must be accompanied by a firm foundation of rules and standards for newly-regulated products. To be successful all of these steps must be done in concert and not in isolation. Regarding the aforementioned challenges with Juul, assuming Altria / Juul can navigate that regulatory process, e-cigarettes are not combustible and therefore one could potentially get higher levels of nicotine in an e-cigarette than they could from a traditional cigarette if this comes to fruition. Altria and Juul can both benefit. Altria also has a cross-licensing agreement with Philip Morris for exclusive right to market the IQOS product in the United States, and they are awaiting a decision from the FDA regarding the approval to sell here. It is important to note that the IQOS heats the tobacco to deliver the nicotine rather than burning it, thereby preventing combustion. Altria can benefit. Altria has apparently been working on a reduced nicotine cigarette, and I believe they would be able to introduce this to the market if mandated by the FDA. One possibility here is that people that smoke may actually increase the volume that they smoke in order to obtain the level of nicotine that they crave, or they could move to one of the risk-reduced products such as IQOS or Juul. Again, Altria can benefit. In addition to the points above, Altria Ventures, which is a subsidiary of Altria Group, has quietly made an investment into Lexaria Nicotine that has a product called DehydraTECH that can allow for delivery of nicotine orally. With smokeless tobacco products being an increasing market, there are a lot of opportunities where this could be applicable. Not only that, but let your imagination loose and consider their stake in InBev and the possibility of a beer with nicotine. Crazy I know, but not necessarily far-fetched. With regard to the potential to ban menthol cigarettes, again that would pertain to the combustible cigarette. While that would certainly be a blow to Altria given the popularity of their Marlboro Menthol cigarettes, it does not include electronic nicotine delivery systems at this time. That means Altria could still benefit via Juul and/or IQOS, as well as smokeless products. Lastly, I believe many of the above possibilities also tie in nicely with Altria’s investment in Cronos. As you look at the cannabis market and the potential for it to be legalized in the United States, the Juul and IQOS could be potential delivery mechanisms. In addition, Lexaria is also heavily involved in the cannabis market and DehydraTECH could be applicable there as well. Through all of the above, I have tried to highlight how I believe a lot of the recent developments as well as the comments from the FDA could potentially benefit Altria. While many pundits are calling for people to sell, I believe that Altria is perfectly situated to navigate this path with the FDA and be stronger in the end. Altria has absolutely recognized that the volume of people that smoke cigarettes has been steadily declining and they are positioned to start capitalizing on alternatives. That doesn’t change the fact that they overpaid for Juul and Cronos, however being at the forefront of an industry shift rarely comes cheap. Some want to believe that Altria management has shot themselves in the foot with their acquisitions in light of the FDA’s recent comments, however I have a contrarian belief that Altria saw this coming and has been proactively moving to take advantage and tighten their grip as an industry leader. I don’t want to pretend that Altria would have wanted their stock to decline by 30% over the last few months, or to face all of these challenges with the FDA, but I do believe this could be the perfect storm to send Altria’s competition reeling and leave them standing at the top of the mountain. With all of the above being nothing more than my opinion, I may end up being the fool by investing more money into Altria. However, by putting my money on the line, I believe much of this is simply people blowing smoke and Altria will pay off handsomely in the long run–and continue to deliver their fantastic dividend along the way. Are people blowing smoke, or will my money go up in smoke? I think you make some great points. By regulating they will eliminate those small players from the picture. I think dope is a huge part of the picture moving forward and surprised they haven’t made some bugger moves with canadian players. But when the us legalizes it they will pounce on the opportunity. These big companies have the money, to own the smaller players. I think its a good buy and will look into it later on. (no usd atm) Hopefully i dont miss the opportunity. Thanks PCI, I think a lot of people share that surprise re: bigger moves in Canada. I have to imagine they are being somewhat cautious to walk the line until the US government legalizes it. Nice summary! I agree with you in all points. This is an opportunity and I also added some this week, albeit not at your super low entry point. Let’s see how it will work out in 5, 10 and 15 years. Nice to hear DR, I believe adding at these levels will be handsomely rewarded over time and until then shareholders will continue to collect that nice dividend. That’s some solid analysis DivvyDad – it’s not easy to go against the crowd and popular opinion, but that’s often where some of the best investments come from. Will be very interested to see how this one plays out! After reading quite a few articles on SA that were forecasting doom and gloom, and how these moves have been mistakes, I thought it would be worthwhile to share my perspective and why I feel buying more is justified. It will definitely be interesting! You and me both Tom, and I agree with you about the quality of the company. They have navigated waters like this in the past and have managed to do quite well. That is also why I believe that they are positioned well for both vaping and cannabis, as if the latter does get legalized you can be sure it will be heavily regulated, and Altria has the experience and resources to navigate that. If history is any indication then seeing MO at these levels should scream “buy.” MO has been navigating tough operating environments for well over 50 years. Declining smoking rates is nothing new… been going down since the 60s and MO kept chugging along. FDA threats, massive litigation, etc. still keeps on chugging. Like MCD has learned to adapt to changing consumer tastes so to is MO, especially with its foray into cannabis and vaping. The cash is there to support the dividend and MO has its eyes on the future with less and less dependence on traditional cigarettes. Long MO myself! Absolutely, and I know you have been buying too. I think that is a good comparison to MCD as over the years both of them have faced challenges that people thought would ruin them, yet they have managed to overcome / adapt. That is what gives me the confidence that MO can do that here, and that the moves they are making and the comments from the FDA can actually benefit them in the long run. There has been so much doomsday talk about tobacco stocks since decades. And yet these companies have been big winners for investors who’ve stuck with them over the long haul. I don’t want to suppress the challanges in this industry. But MO trying to diversify its earnings sources (through vaping and cannabis) is acutally a good thing going forward. Long MO! Thank you for the article, DD! Thanks SF, I agree and hope that I have not trivialized the challenges that are ahead. But I do believe that Altria is extremely well positioned, and experienced, in managing similar challenges from a regulatory perspective. DD – I just purchased the same amount of MO (35) but you got it for a couple cents less than me. I might add a bit more this coming week- we’ll see what the market does. Just seems like a smart move – and its been featured on a few div blogs so we’re in good company it seems. Thanks D4J, and welcome to the site! I’m really happy with the price that I was able to get, and sounds like you also got it at great price. We will see if that was the bottom or if there is additional pressure that pushes them back down. Absolutely agree with you DivvyDad. I just added to my MO position along with another position, propelling my forward annual dividends over $500. More on that to come in a couple weeks, but it’s the fact that some won’t even consider investing in tobacco for moral reasons and the fact that Wall Street is irrational that Altria is trading at a yield not seen since the Great Recession. At the current price of $44 and change, investors are baking in 3% long-term dividend growth for a company that has a historical rate of nearly 3 times that. Despite risks, I don’t buy into those gloomy forecasts one bit. Solid investment on your part that will have an utterly insane YOC in 5-10 years. That’s awesome Kody and quite the boost to your forward income! Great to see that you have also added to your position at these levels. I am in agreement with you that in 5-10 years time there will be some very solid returns.